I've always loved glass in its many forms, and have collected beads and made jewellery for more years than I care to remember. I'm a freelance illustrator by profession, based in the UK, but in the latter half of 2005 I decided to bite the bullet and have a go at working with glass, myself. I started out by enrolling on a fusing course at Manchester Stained Glass. I was taught by the wonderful glass artist Jodi Wright, whose beautiful jewellery and fused pieces I fell in love with. I was then lucky enough to take a one day class with the amazingly talented glass artist, Laura Sparling in December '05. 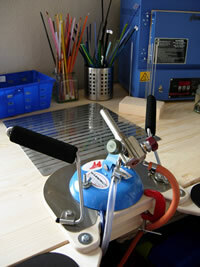 Where I learned the basics of lampwork beadmaking, and bought the equipment to get me started. It was a fabulous day, and I still look at my first little collection of wonky beads with great affection. Now, with an ever expanding collection of glass rods, the acquisition of a digitally controlled SC2 kiln and a dual fuel torch, I'm still beading, fusing and jewellery making, and loving every minute of it. I've met lots of wonderful people over the last few years, both personally and virtually, and I can happily say it's been a great glassy adventure that I hope will continue for many more years to come!